About Institute : [Best Animation School] IIDAA offers a wide range of Govt. certification courses, Regular Full time Degree Programs and Distance Education Programs specialized in 2D, 3D Animation, Film Making, VFX, Photography and Cinematography pursuing which the students' achieve Academic and Practical eligibility and develops a portfolio to progress to any of the comprehensive Media Industry in India and World-wide. About Institute : Unitedworld Institute of Design in one among the top design institutes in India. Uninedworld offered varied programs in Animation, Graphics and Gaming Technology. UID comes under the Karnavati University and is member of Cumulus - The International Association of Universities and Colleges of Art, Design and Media. Cumulus consist of 257 members from 57 countries and serves globally towards art and design education and research. About Institute : Arena Animation was started in 1996 and is an educational branch of Aptech Ltd. Arena is training students in Animation, Web Designing and VFX. Arena Animation predits a giant growth of Animation & VFX industry in India which will be worth 11360 crores in 2020. Various courses in Animation, film making, VFX, multi-media and web designing are offered in Arena Animation. Arena Animation focuses on employment driven education that helps students to prepare for a successful career. About School : Frameboxx Animation & Visual Effects is a versatile conglomerate with a focus on providing high end media and entertainment training & related services. Started in 2007 by a team of management and technical evangelists with over ten years of experience in the Animation & Visual effects production & training domain, Frameboxx offers a wide array of training programs aimed at producing high quality trained manpower to fuel lndia's Media & Entertainment industry. About College : Picasso Animation College has earned a reputation as a stalwart in the field of animation.Picasso Animation College stresses upon creativity and inspires its students to think beyond the box. About Institute : Asian institute of Gaming and Animation (AIGA) is a cutting edge hub for students aspiring to influence the future of AVGC industry. Incorporated in the year 2008, AIGA is the pioneer institute in India, dedicated to gaming education. 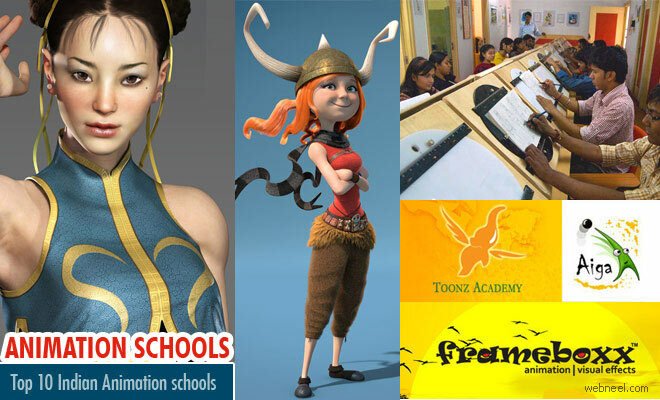 About Academy :Toonz Academy is one of the Top Animation Schools in Kerala which is dedicated to animation. Toonz Academy is the training division of the famous award winning animation studio, Toonz Animation India Pvt. Ltd. The studio credited with some of the 'first' in Kerala, the first animated TV series - Tenali Raman, the first animated film - The return of hanuman and the first digital animated Malayalam feature film - Swami Ayyappan. About Institute : The Centre was established in 1998 after having felt the urgent need of an institution for diversified and advanced educational research, consultancy and training of human resources in IT and Management technology in the Northern sector.ocated in a posh area joining Noida and Delhi, adjacent to many important industrial houses like Indian Oil Corporation, Bharat Petroleum, Kribco, PDIL, GAIL etc. Department of animation and multimedia offers short term and long term courses. About School : FX School is a high quality institute in the fields of animation, visual effects, digital painting, photography and digital filmmaking, collectively called digital content creation. FX School is equipped with world class infrastructure and is the first school in India to have a production ready environment including a state-of-the-art chroma studio, fully-equipped practice labs and art rooms. The most unique feature, however, is that FX School offers an inspirational learning environment complete with a café-lounge and personalized continuous career counseling that helps ensure students stay on track for a successful career. About School : [Best Animation School] School of Animation, Digital Asia was founded in the year 2003. The school was set up with the idea of transforming the artistic capabilities into quality animations and hence deriving quality animators. Gradually the school became the most popular and renowned hub for quality animation training, where students get the opportunity to explore, transform their imaginations into reality and come out with not just knowledge of animation tools & software, but also the overall big picture.